O’Brien Rare Coin Review: Why is the 1933 British Penny so valuable? 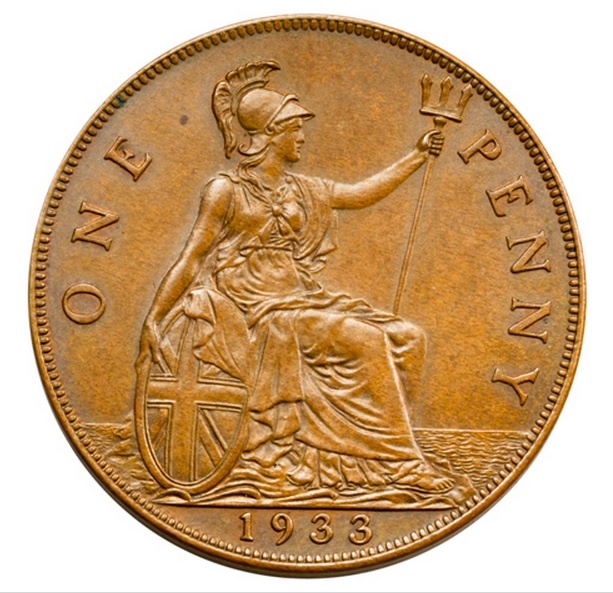 The 1933 British Penny is, perhaps, one of the most famous coin rarities in the English-speaking world today – allegedly only seven coins were minted – specifically for the king to lay under the foundation stones of new buildings. So why do so many people claim to have a 1933 penny on their possession or to have seen one? The answer is simple – I myself have seen many examples of “1933 pennies” over the past 30 years – all of these were Australian, British West Africa, Jersey, or Irish pennies, and their owners, usually victims of their own wishful thinking, forgot to mention the fact that they are not British pennies. Getting back to the rare 1933 British penny – there was no requirement for the Royal Mint to produce any pennies in 1933 because there were already more than enough in circulation. In fact, the Royal Mint had been steadily reducing its output since 1927 (see table below). no British pennies were produced between 1923 and 1925, inclusive. That said, requests were received for sets of coins dated 1933 to be placed under the foundation stones of buildings erected in that year, and the Mint obliged by striking a small number of pennies to make up these sets. The myth behind the reality was that people thought they could turn up in their change – a highly unlikely occurrence since these pennies were all buried beneath foundation stones. However, in 1939 World War Two broke out and most English cities were subjected to ‘the blitz’ by German bombers and many public buildings were destroyed or badly damaged – this gave some possibility that one of the coins might have been dug up and spent on food – an ‘urban myth’ that became ‘almost a fact’ during the ‘run up’ to the UK’s decimalization on 15 February 1971. Around about that time and in the midst of a nationwide search for the missing penny, one of the original buildings – the Church of St. Cross, Middleton, Leeds, Yorkshire – which was originally half-brick and half-timber construction began to attract the attention of criminals. The timber part had been demolished in the 1920s and, when the construction of its replacement commenced in 1933, a compete set of 1933 coins were duly placed under the foundation stone. It’s current whereabouts is currently unknown. The Church of St. Cross, Middleton, Leeds, Yorkshire still stands, i.e. only the foundation stone in one corner was dug up and the damage has been repaired – see photo above. In addition to the above 7 pennies, and of even greater rarity and value, is a 1933 pattern penny engraved for the Royal Mint by Andre Lavillier – only four of these 1933 ‘pattern’ pennies are known to exist. Generally speaking, these 1933 patterns are valued at half the price of a circulating 1933 penny. A ‘pattern’ or ‘trial’ is a coin which has not been approved for release, usually produced for the purpose of evaluating a proposed new or modified coin design. In the instance of King George V’s coins, there were problems with the obverse side of the coins – the large head was causing an uneven displacement of metal on the reverse side – resulting in ghosting of the bust, i.e. a faint image of the king’s head was appearing on the opposite side after striking of the dies. The consequent and on-going experimentation with the design resulted in no less than three variations of the left-facing king’s head. After a three-year gap in production the alloy composition was changed in 1925 to 95.5% copper, 3% tin, and 1.5% zinc, although the weight remained at 1⁄3 ounce (9.4 g) and the diameter 31 millimetres. A good example of a ‘pattern’ around this time is the penny of King Edward VIII (1936). Only one exists: it is dated 1937 and was produced for official approval just before he abdicated in favour of his younger brother, the future King George VI. Beware of fakes – there is a lot of them out there! This coin is also a fake – a rather clumsy attempt to alter the date by engraving or transplanting digits. It was, allegedly, bought for about £100 on eBay in the vain hope that is was genuine. This example is taken from a photo by The Royal Mint (as displayed on their website). It is possibly one of the four patterns. On 10th August 2010, excitement was building on eBay as a 1933 British Penny reached over £1,000 + £4.95 postage – when the owner stopped responding to questions and mysteriously withdrew the coin from the auction. Was it a fake, the 7th (stolen) coin or was it example #8 ? ? ? In addition to the fakes that are occasionally fraudulently offered for sale, there are number of private mints offering facsimile copies. These are sold as facsimiles and are not intended to deceive. They are very obviously not the genuine article, as can seen from the illustration below. A potential problem arises, however, after they change hands a few times and the then current owner doesn’t realise they were bought as facsimiles and thinks they might be real. 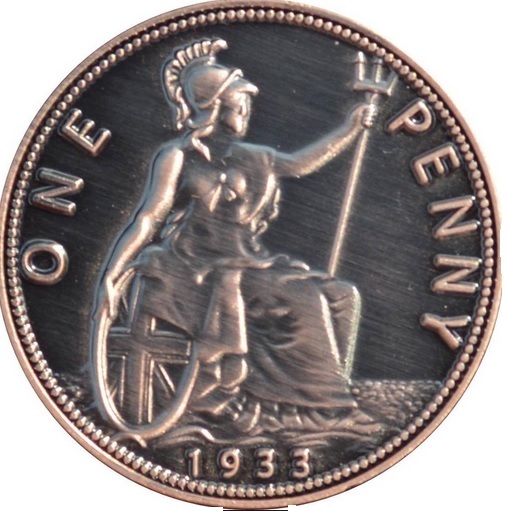 The 1933 facsimile British Penny is not intended to deceive but it could be mistaken as genuine by future owners that lack the numismatic knowledge to identify it as a facsimile. This 1933 facsimile penny is clearly not the genuine article – as can be seen by the many deliberate design flaws. It is not intended to deceive. As previously mentioned, the 1933 British penny is famous because people have spent half a century talking about where the ‘missing’ ones might be. What most don’t realise, is that there is an even rarer British penny, i.e. the elusive 1954 British penny. Only 1 has ever been found ! O’Brien Rare Coin Review: Why is the 1954 British Penny so valuable? Now if you GENUINELY liked this post then it would be a HUGE help if you left a rating, or a review. It might seem insignificant, but it helps more than you might think. Do you collect British coins? I have a 1933 Jersey penny. Is it valuable? There were 204,000 of them minted, so the 1933 Jersey penny is not quite in the same league as its British counterpart. They are available for about £5 each on eBay but I am pretty sure your local coin dealer could sell it cheaper. I have a Half penny 1933 how do I get it authenticated if its fake or not ? A 1933 British halfpenny is very common and almost worthless – why would you want to have it authenticated? On a recent holiday to Cornwall my family and I where looking for shells on a beach and I came across a lump of “rock” with a coin protruding from it. At first I left it but then my inquisitive nature got the better of me and I managed to retrieve the coin from it. It was not a rock. I could not identify the material in which it was embedded however there where also some bolts encased in it. After some research my sister identified the coin as a George the 5th penny unfortunately, the coin is in poor condition and the date it practically unreadable. Is there anything that could identify the the coin. I can almost make out a 1 9 and a 3. It may just be me being stupidly hopefull that it is a 1933 penny and the lump I removed it from was actually part of the foundations in which it was laid. If there is anything I can do to identify the coin I would much appreciate the advice. They will let you know where the nearest Finds Officer is located + their contact email. 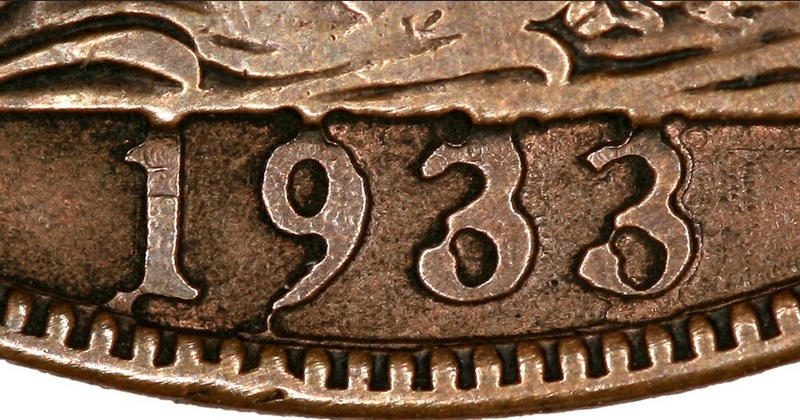 Its unlikely that your penny is a 1933 … but you never know !!! Many thanks for that correction. I have updated the article accordingly. I will then be in a better position to answer your question. and compare your coin to their coins. Then check out their grade. Really interesting article, great info . I have seen a 1933 penny in the archeology museum in Valletta Malta. Could not tell of its original. Information from site excellent. Please,, mail me British west 1933 coin at p.o box 341006 Jamaica NEW York,11434 thank you. I hope this article encourages you to collect coins … and, perhaps, keep an eye out for that ‘missing’ 1933 penny ! What a fabulous and informative site. Reassuring the internet would be pointless without sites like this. Thank you, and keep sharing your knowledge. Hi , Im am curious with this coz I have 1 of this 1933 penny coin . Can you if this is genuine or just a fake . Thanks . Read the article + look carefully at the images. – It should be obvious if its a 1933 British penny, or not.